Sarto produce more than 2500 frames each year. They see the customization as their strength, which allows them to satisfy the customer’s every need: the choice of materials, the shape of the tubes, made-to-measure geometries, graphics and reinforcements in Kevlar or titanium/carbon. Every feature of a Sarto frame can be changed and selected by the customer. Sarto design and create new models each year, which are presented at the important trade fairs before making their way around the world. The company has been working with carbon for more than 15 years, from the time when frames wereglued together at the joints. Starting in 2002, the company began producing laminated frames, a process that originated from the need to “customize” and make every piece unique. Lampo is the custom carbon frame which combines aerodynamic features with stiffness into a unique bicycle. Through careful CFD (Computational Fluid Dynamic) analysis, every profile of the tube set that forms Sarto Lampo has been optimized from the aerodynamic point of view. The down tube that integrates the fork, ISOFLOW seat stays, internal cable routing, seat tube with Kamm tail aero profile are just some of the most striking aspects resulting from aerodynamic studies. In addition to these peculiar characteristics that identify Lampo, the high stiffness of the frame enhanced by the integrated oversized seat tube minimizes the energy dissipation. 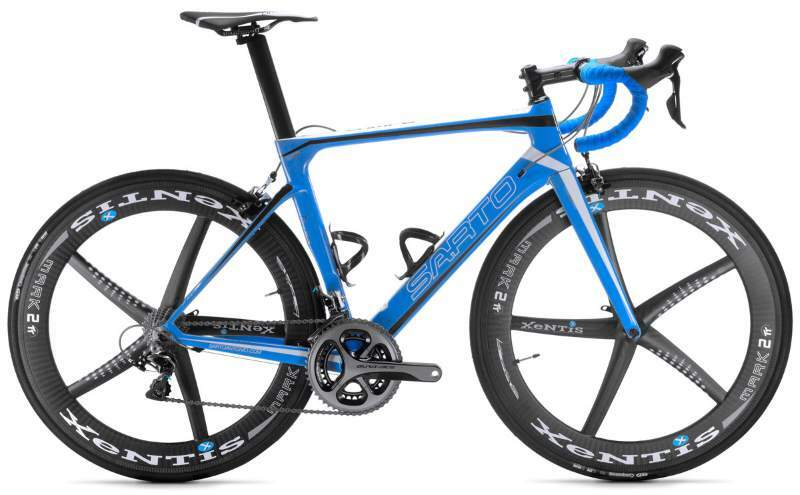 Sarto Dinamica is a perfectly balanced frame for the Criterium/Road/Gran Fondo rider. Weighing only 700 grams, Seta road frame is the latest and most advanced frame Sarto has ever produced. The Seta features brand new tube designs, starting from the flat shape of the top tube to the ultra thin chain stays. The Seta is made of the best and stiffest carbon the market has to offer, M55J. This type of high modulus carbon fibre ensure great compressive and tensile strength.